Djinn & Tonic has just released two very interesting designs. These two dresses are different than dresses you would normally see around the grid. 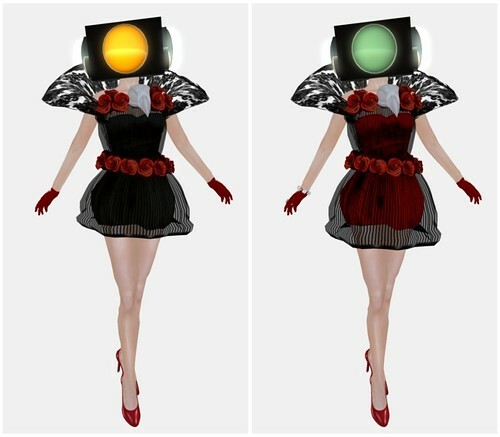 I really like the colors on the Death of a Lover dress, but the Mask (traffic light headpiece thing) is kind of too out there for me to wear. However, I think the whole outfit would be really great for fashion photos. This dress has a great lace pattern on the skirt and pretty roses on the collar piece. I imagine that Frida Kahlo, the famous Mexican painter, might wear a dress like this. yeah, the headpiece is definitely the one thats almost identical to the music video. looks like something lady gaga would wear in real life, though. haha.